3m long 586mm wide Uni-Xu type A1 aluminium horizontal belt conveyor. 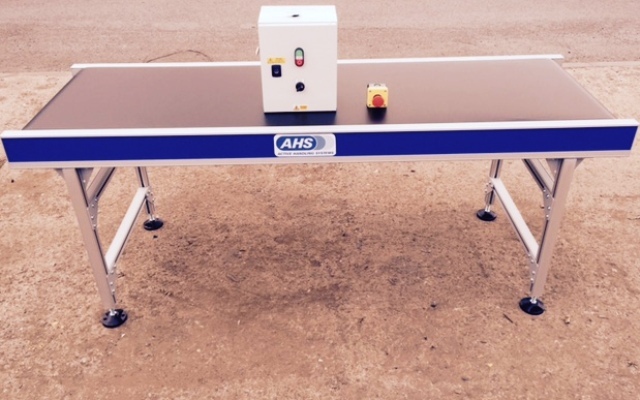 1 only 3m long Uni-Xu Type A1 aluminium horizontal belt conveyor incorporating a 586mm wide smooth black pvc self tracking belt running on a mild steel slider bed. Powered by a 3 phase motorised drum unit at 13m/min approx. Load rating 20 kg per metre. Mounted on adjustable support frames to give a nominal height of 840mm. 60mm high sideguards fitted both sides. No electrics. Pictures are representative only. We can offer variable speed stop/start control and additional e stop buttons auto stop/start photo cells. Please contact us with your exact requirement. Other lengths and widths available – up to 6m long in 1m increments. Usual lead time – 2/3 weeks. However we do keep 2m and 3m long units in all 3 widths ex stock.